Although there are now hundreds of different cryptocurrency exchanges which allow you to buy, sell and trade Litecoin, hardly any of them accept PayPal! As a result, there is no direct way to buy Litecoin with PayPal. You will need to first buy Bitcoin using your PayPal account, and then exchange Bitcoin for Litecoin at an exchange. But don’t worry, I’ll guide you through the steps. In my ‘Buy Litecoin with PayPal’ guide, I am going to discuss two different platforms that accept PayPal and explain how they both work. After that, I am then going to give you a really simple step-by-step guide on how to complete your PayPal to Litecoin trade from start to finish! So, what are you waiting for? 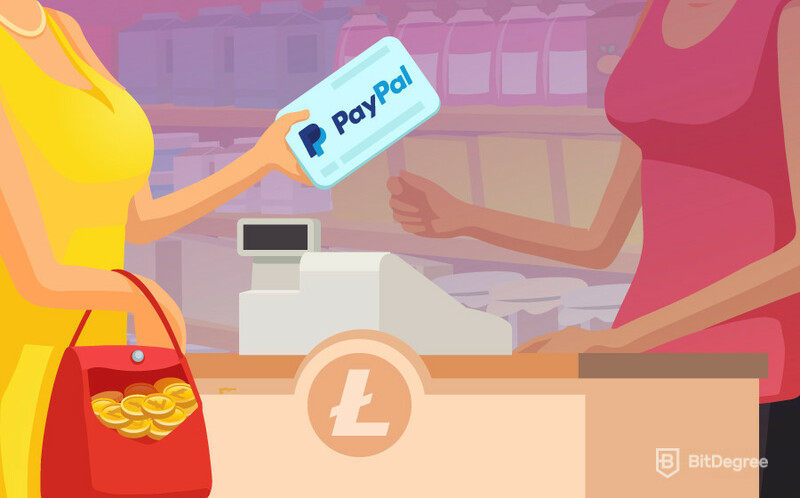 In the first part of my ‘how to buy Litecoin with PayPal’ guide, we’ll start by finding out why it’s so difficult to buy cryptocurrencies using an e-wallet like PayPal! 2 Where can you Buy Litecoin with PayPal? Cryptocurrency exchanges don’t seem to like PayPal because of the risks involved. One of the main reasons for this is that PayPal have something called ‘Buyer Protection’. This allows the buyer to request a refund if somebody sells them something that doesn’t match the description. In most cases, PayPal favors the buyer. This means that the seller has no choice but to refund the payment. In the case of buying Litecoin and other cryptocurrencies, there is no sure way to prove that the seller actually sent the coins. This means that the buyer would pretend they never received them and then request a refund from PayPal! As a result, merchants often charge higher fees to protect themselves from a chargeback! Therefore, it is important to remember that the options I am going to give you are much more expensive that using other payment methods! So, now that you know why it can be difficult to buy cryptocurrencies using PayPal, the next part of this ‘buy Litecoin with PayPal’ guide will look at where this is actually possible. Where can you Buy Litecoin with PayPal? The first option I wanted to discuss with you was LocalBitcoins. They are a peer-to-peer exchange that allows you to buy and sell Bitcoin directly with other users. Based in Finland, they were first launched in 2012 and now serve customers in more than 248 different countries! When you access the platform, you will find a long list of individuals that are looking to sell their Bitcoin, with the price that they are happy to sell it for and their preferred payment method. The process is really simple. Once you find a seller that is happy to accept PayPal, you enter the amount you want to buy and once the seller accepts, they will then send you their PayPal address. At this point, the Bitcoin is locked within the platform and it is released as soon as the seller can see you have paid! There is also a really cool rating system like eBay, where buyers and sellers can leave feedback after a trade is completed! The time it takes to buy Bitcoin with PayPal using LocalBitcoins isn’t long at all. In fact, it should not take you more than 10 minutes to complete the trade! So, now you know what LocalBitcoins is, the next part of my ‘How to buy Litecoin with PayPal’ guide is going to look at their fees! When buying coins at LocalBitcoins, the platform doesn’t charge any fees to the buyer. Instead, the seller chooses the rate that they want to charge. The prices can vary quite a lot, meaning that you can sometimes pay at a rate which is much higher than the current market price. As you will see from the above screenshot, the price of buying Bitcoin with PayPal starts as low as £5,779.87 and goes all the way up to £6,975.70! That’s a difference of almost 20%! On top of accepting PayPal, LocalBitcoins now supports more than 20 different payment methods. This includes everything from a local bank transfer, SWIFT, Pingit and even cash in the mail! However, I wouldn’t recommend sending cash or meeting in person as you would not be protected by the LocalBitcoins escrow service! The great thing about LocalBitcoins is that it doesn’t really matter which country you are buying from, as PayPal is a global payment method. This means that if you find a cheaper seller that is located in a different country to you, you can still buy from them. So, now that you know about the fees and the different payment methods at the exchange, the next part of my ‘buy Litecoin with PayPal’ guide is going to give you step-by-step instructions on how to make a purchase at LocalBitcoins. The first thing you need to do is visit the LocalBitcoins website, which you can do by clicking my link here! Look for the green Sign up free button and click it! You will now need to enter some personal details. It is probably best to use your real name, as some sellers will ask you to verify yourself with them before they accept the trade. When you’ve completed the account opening process, click on Buy Bitcoins at the top of the screen. In the first box, enter the amount of Bitcoin you want to buy. The currency will be based on the country you are located in, but you can change this if you want. You can also change the country that you want to buy from if you can’t find any sellers that accept PayPal.Now click on the All online offers box and look for PayPal. Then click on Search. Once your search results load, you will see a list of sellers that are happy to accept PayPal. They are ranked based on the price that they want to charge. On the left side of the screen, you will see the seller’s feedback score and the amount of previous trades they have completed. Ideally you want to choose a seller that has 100% feedback, and a good amount of trades (50+). 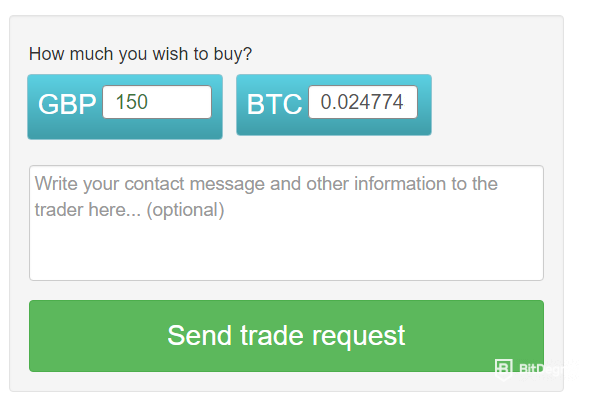 You should also take a look at the limits box, which is the amount of Bitcoin that the seller is looking to trade. In my example, the top seller has a feedback score of 100% and they have completed more than 100 trades. They are also offering the cheapest exchange rate, so I am going to choose them! Once you have selected your seller, click on Buy. At this point, the seller hasn’t been notified that you want to trade. So, before you continue, make sure that all of the details are correct. Another thing that you will need to look for is the sellers’ terms on the right side of the page. Every seller lists their own individual terms and conditions, so just make sure that you are happy with them. Sometimes they ask for ID, or like in my example, they say that they will only trade with a buyer that has completed more than 30 successful trades. If you don’t meet their terms, all you need to do is go back to the search result page and choose another seller! If you want to continue, scroll down and click on Send Trade Request. The seller will then be sent an instant notification with your request. They will check the information and then send you their PayPal address. You can speak to the seller using the chat box if you have any questions. Go to your PayPal account and transfer the funds. Don’t forget to enter the reference number that the seller provides.As soon as you have sent the payment, click on Payment Sent. The seller will now receive a notification that you have paid. At this point, the Bitcoin is still locked in the escrow. The seller still needs to check that you have actually sent the payment! Once they can see the payment has arrived, they will release the Bitcoins from the escrow. Congratulations! You’ve just used our first method for buying Bitcoin using PayPal. Bare with me though, as soon in this ‘Buy Litecoin with PayPal’ guide, I will show you how to exchange your Bitcoin for Litecoin! However, first I want to discuss an alternative option… Let’s take a look at VirWoX! Created in 2007, VirWoX are a platform that allows people to trade a digital coin called ‘Second Life Lindens’ (SLL). This coin is a currency that is used in a game called ‘Second Life’ and it allows players to buy a range of virtual goods. It is not a cryptocurrency like Bitcoin or Litecoin, and it can’t be used anywhere other than in the game. You might be wondering why I am telling you this!? Well, the VirWoX platform also allows people to trade Bitcoin too! And guess what? It also accepts PayPal! The way it works is like this: you fund your VirWoX account with PayPal, and then exchange your fiat currency for SSL coins. Once you have done that, you will then need to exchange your SLL coins for Bitcoin. After that, you will be required to withdraw your Bitcoin to a cryptocurrency exchange and then trade them for Litecoin! 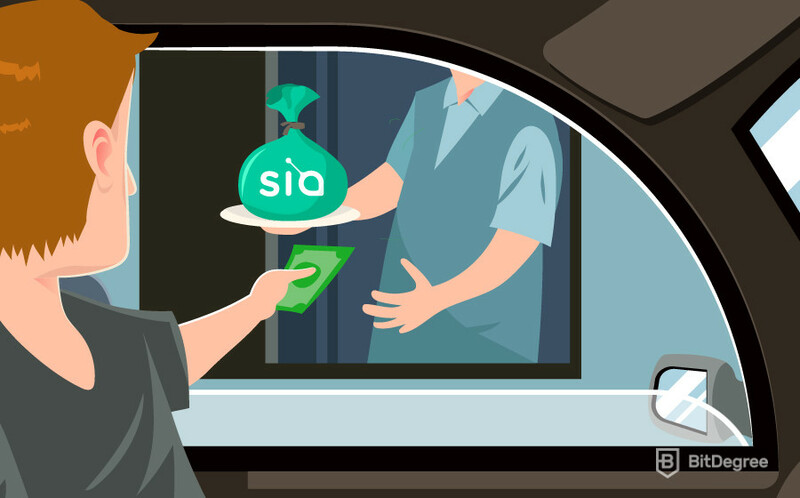 Although the VirWoX platform has been built specifically for SLL coins, they accept a wide range of other payment methods. On top of PayPal, they also accept debit and credit cards (through Skrill), Klarna, Playsafe Card and OK Pay! Due to the risk of accepting PayPal, the VirWoX team have installed some deposit limits. When you first sign up you will also have to wait 2 days before you can make your first purchase! Once this time passes, you will be able to use your PayPal account to deposit 90 Euros. Once a further 10 days has passed, this increases to 120 Euros. After 30 days, this goes up to 200 Euros. 400 Euros after 60 days and then finally, 1000 Euros on request. The team do not make it clear what you need to do to get it up to 1000 Euros, but I think they will probably want you to verify your identity by uploading some ID. Also, your PayPal account will need to be a verified account, otherwise VirWoX won’t let you deposit! So, now that you know about the payment options at VirWox, the next part of my ‘Buy Litecoin with PayPal’ guide is going to look at their fees! One of the biggest disadvantages to using your PayPal account at VirWox is that the fees can get really high. When you make your initial deposit, you will need to pay a 3.4% transaction fee. After that, you will then need to make two separate trades. Firstly this will be EUR>SLL and then SLL>BTC. Depending on the exchange rate that the other sellers ask for, this could start to add up quite significantly. And finally, don’t forget that you will then need to transfer your Bitcoin to a cryptocurrency exchange to trade them for Litecoin, which will also cost you additional fees! Unfortunately, no matter which option you go for, using PayPal to buy a digital currency will always be much more expensive than traditional methods. This is because the risks are much higher! So, now that you know how to buy Bitcoin with PayPal, in the next part of my ‘Buy Litecoin with PayPal’ guide I am going to show you how to trade your Bitcoin for Litecoin! I have decided to use LocalBitcoins in my example, as I find the process much easier than using VirWoX. The fees are also cheaper and there are less steps involved. Also, there are hundreds of cryptocurrency exchanges that will allow you to trade Bitcoin for Litecoin, however I have selected Binance. The reason for this is that their trading fees are one of the lowest in the industry, they have the largest trading volume and security is high too. Visit the Binance homepage by clicking here. You will need to open an account, which should take no more than 2 minutes. You don’t need to provide any personal information, meaning you can trade anonymously! Once you are all set up, click on Deposits at the top of the page. 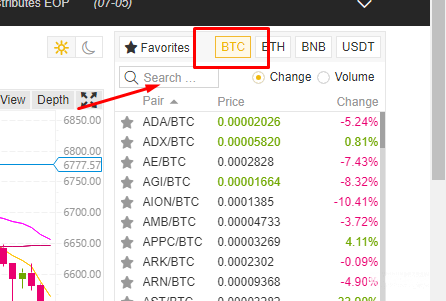 In the drop-down box, search for Bitcoin. Be very careful here as there are lots of variations. Make sure you are selecting BTC – Bitcoin, which should look the same as my screenshot below. 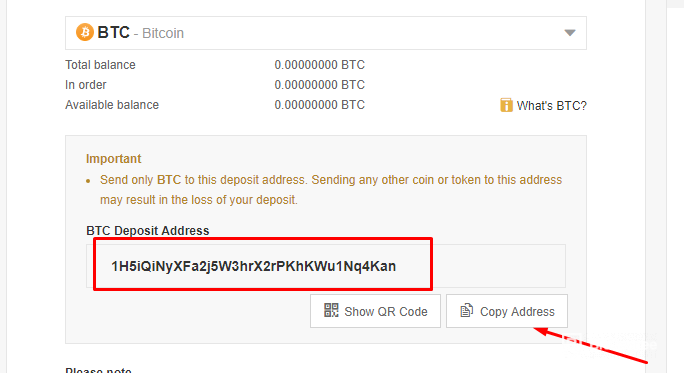 You will now be shown your unique Bitcoin deposit address for Binance. Click on Copy Address. 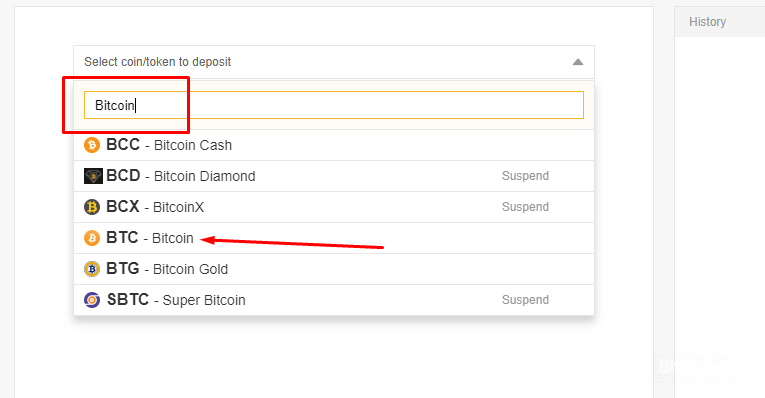 Now that you have set up your Binance account and copied your deposit address, you now need to go back to your LocalBitcoins account! At the top of the screen, click on Wallet. 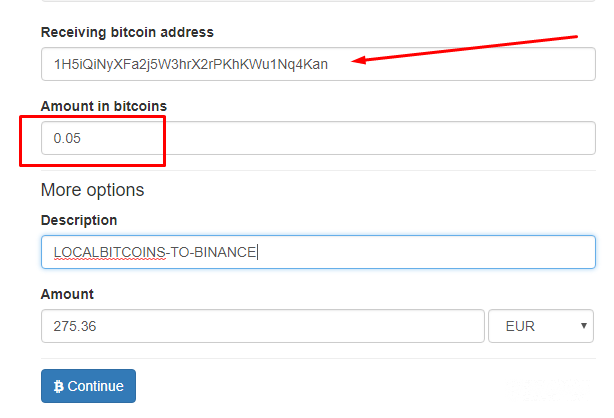 Now you need to paste your Binance deposit address in to the Receiving Bitcoin Address box.You also need to enter the amount of Bitcoin that you want to transfer. LocalBitcoins also allows you to enter a description, which is basically just a reference. Finally, click on the blue Continue box to complete the transfer. The coins should show up in your Binance account within about 10 minutes! If you have followed my step-by-step instructions so far, you should now have a Binance account that is funded by Bitcoin. The final part of my ‘how to buy Litecoin with PayPal’ guide is going to look at how to make a Bitcoin-to-Litecoin trade on Binance! At the top of the screen, hover your mouse over Exchange, and then click on Basic. Now we need to find the Bitcoin (BTC) / Litecoin (LTC) trading pair. On the right hand side of the page, click on BTC and then search for LTC in the search box. 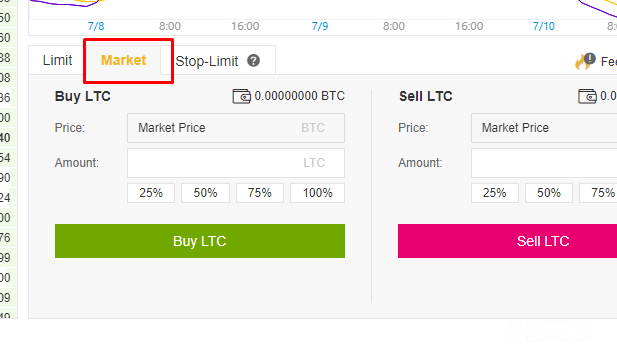 Now click on the LTC/BTC pairing that appears from your search result. You are now on the main trading page for LTC/BTC! I know at first it can look really scary, but its simpler than you think! Scroll down below the trading charts and look for the Buy LTC box. Now click on Market. This will allow you to buy Litecoin at the current market price. Now you need to enter the amount you want to buy. You can either enter this in to the Amount box. Finally, to complete your Bitcoin to Litecoin trade, click on Buy LTC. If you bought using this method, your trade should go through straight away! Congratulations, you’ve just purchased your Litecoin using PayPal! If you have read this ‘Buy Litecoin with PayPal’ guide from start to finish, you will now know how difficult it is to use your PayPal account to buy Litecoin… Unfortunately, if you really do need to use PayPal, then the only way that you can do it is to first buy Bitcoin and then exchange it for Litecoin. Did you know that there are now lots of cryptocurrency exchanges that accept other real-world payment methods such as a debit/credit card or bank account though? This might be worth considering, as not only would buying Litecoin this way be cheaper, but it would be much quicker too. What’s really annoying is that Coinbase (the largest broker exchange in the world) allow you to withdraw funds to PayPal, but they don’t let you deposit. How frustrating! Ultimately, the good news is that buying Litecoin with PayPal can be done, but just be prepared to go through lots of steps. Let me know if you found this step by step guide helpful, or even better, if you can think of an even better way to buy Litecoin with Paypal.